From the very first play, it was clear the Réseau du sport étudiant du Québec semifinal game was going to be an uphill battle for the Concordia Stingers. The Université de Montréal Carabins were picking up large chunks of yards seemingly at will. The Stingers defense look confused and ill-equipped to deal with them out the gate. The early moments of the game made it abundantly clear why the Carabins were the strong favourites in this matchup. The Stingers’ inability to contain their opponent would hurt them all afternoon. The team wasn’t limited to defensive mistakes. On offense, the Stingers could get nothing started, spending most of the first quarter punting after two and outs as quarterback Adam Vance was sacked and all-star running back Jean-Guy Rimpel was swallowed up on rushes. Despite leading the league with over 700 yards in 2017, Rimpel was held to just 13 yards in the first half of the game. 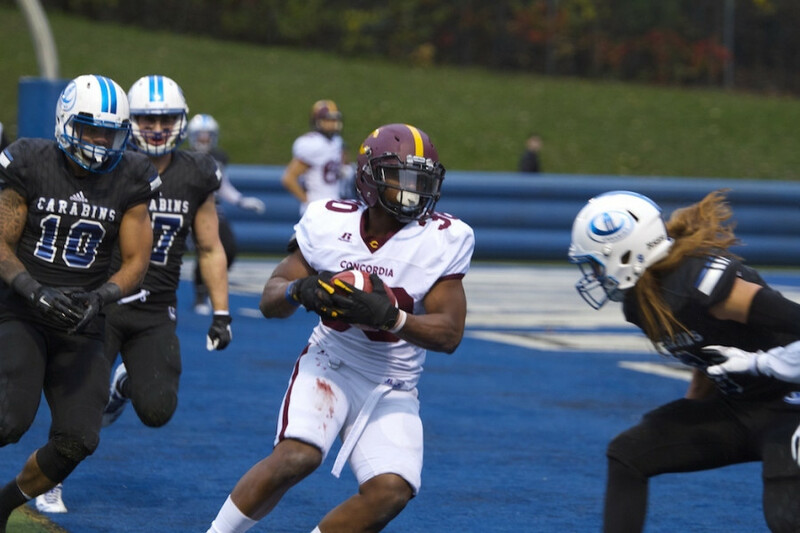 The Stingers looked powerless to stop their opponents as the Carabins imposed their will, taking a 10-0 lead near the end of the first quarter. It was a particularly tough game for the receiving core. Only two of Concordia’s receivers made more than two receptions through the afternoon. Taylor would provide a ray of hope for the team as he reeled in a 42 yard touchdown from Vance after the quarterback threw an identical 42 yard pass to Sam Nadon one play earlier to put them into Carabin territory at the end of the first quarter. The back to back long plays seemed to give the Stingers some momentum as the defense came up with a big stop despite all their inability to make open field tackles. The success was short-lived, though, as the next drive showed the same offensive failures as the start of the game. The defense followed up by allowing a long touchdown run on third down to put the Carabins up 17-7. From there it was more missed chances and a complete inability to contain their opponents, particularly on the run. “I think [self imposed mistakes have] been our issue all year. We’re a team that’s still maturing” said offensive coordinator Matt Connell who saw his team finish the first half down 24-7. At the opening of the second half, Concordia’s play opened up, feeling that they could take perhaps some bigger risks being down already. Connell’s offense saw some success in the later stages of the game thanks to this, but it was too little too late. Despite some solid play by Vance—who threw 161 yards on 11 completions before being replaced by defensive back Quaid Johnson to prevent injury—and a defensive takeaway, the Carabins already knew they had the game in hand. Concordia decided to show this not only by putting up touchdowns, but by flexing their muscles and taking group photos in front of the Stingers during breaks in play and exuberantly celebrating every hit they made regardless of how many flags they drew and yards they lost. The Carabins weren’t worried about giving the Stingers yards, they knew Concordia was outmatched. As their opponents put up pick sixes and touchdowns, the Stingers eyes looked towards the future. Connell’s attitude is similar, focusing on how to fix mistakes now and improve next year’s roster. With his mind already on recruiting, Connell wants to bring in more internal competition for next season to improve the team’s depth. The team seemed to be of a mind following the 42-20 elimination loss. Cornerback Khadeem Pierre Summed it up well.